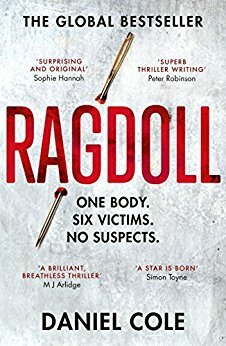 A body is discovered with the dismembered parts of six victims stitched together, nicknamed by the press as the 'Ragdoll'. Assigned to the shocking case are Detective William 'Wolf' Fawkes, recently reinstated to the London Met, and his former partner Detective Emily Baxter. The 'Ragdoll Killer' taunts the police by releasing a list of names to the media, and the dates on which he intends to murder them. When a body is found made up of six different victims the Met police must find out who the victims are and who the murderer is. Detective William Fawkes has more to lose than any other officer involved, he's only recently being reinstated, the body was found pointing into his apartment window and now his name has ended up on a list created by the murderer. He has to try and save the other people on the list and himself. Ragdoll was full of suspense, twists and turns and the ending was left open for future Fawkes and Baxter novels. It was everything a crime novel should be and kept me gripped from start to finish as I tried to work out the case alongside the detectives. There is another book in this series with another set for release next year and I'll definitely be giving them a go. My only hang up about this book is that the huge amount of characters made it a little difficult to keep up with at times and on more than one occasion I had to flick back through the book to jog my memory about a certain character, who they were and how they were involved. The story would still have worked with less characters so I'm hoping the other book in the series don't have a massive character list too.